Custom Orthotics - "Are they right for me?" The orthotics industry can be quite confusing and intimidating for someone considering a foot solution, or the idea that changing your foot support can influence your knees, hips, back, and beyond. The prices range from pennies to hundreds, and it is publicly unclear how to choose what is right for each person. Let’s talk about the facts of orthotics, to better understand whether they may be suited for you. If your pain or discomfort is arising from a body part that is not directly linked to your foot, and the reason for those symptoms include soft tissue and motor control issues (not necessarily just ‘alignment’), then orthotics may not be the solution for you. For example, if your hips are weak and not performing the jobs they should, and this is the primary cause of your foot pain, then orthotics will not strengthen your hip muscles. Contrastingly, if your hip have become weakened because of poor input FROM the foot, the orthotics will play a very influential role in improving your low extremity base by helping those muscle to engage easier, and function the way they should. These two examples are expertly discerned by physiotherapists at Motion Works Physiotherapy, and can be difficult to differentiate. If you are experiencing any lower body pain or discomfort, it’s important that you consult your physiotherapist for a biomechanical analysis prior to deciding whether orthotics are right for you. Your physiotherapist will play a large role in determining what is best for your pain. Ah, the big question … What is the difference? To start, an insole generally consists of a padded area that offers some absorption assistance, but no structural support or rigidity. They may range from a flat pad fabric, to raised cushioning for the arch and heel. Insoles are available off the shelf, which means that no store bought insole is individualised to your foot. Just as each person is different in their own unique way, the same can be said of our biomechanics, our bone structure, our anatomy, and ultimately our feet. An insole may be comfortable and symptom-relieving for a period of time, but there is limited evidence on whether or not these pads play any role in affecting any underlying biomechanical dysfunction that may exist at the foot (or upwards). Take the ‘customized Dr. Sholl’s Orthotics’. A machine, which you may have seen or even used, allows you to stand on the platform which measures the forces exerted on your foot. It will also take a measurement of your foot size, and consequently produce a ‘custom’ pair of orthotics based on those results. What this machine lacks in designing an orthotic is the dynamics of the foot as we walk and move, which is often the contributing culprit of our pain. If this insole is designed for an immobile person to have no discomfort in a single position, then this is the orthotic for you. However, we are mobile creatures, and movement is necessary for the most of us. device with 4096 pressure sensors). You should consult your physiotherapist on the nature of your foot/lower body discomfort prior to deciding whether any type of orthotics may be right for you. 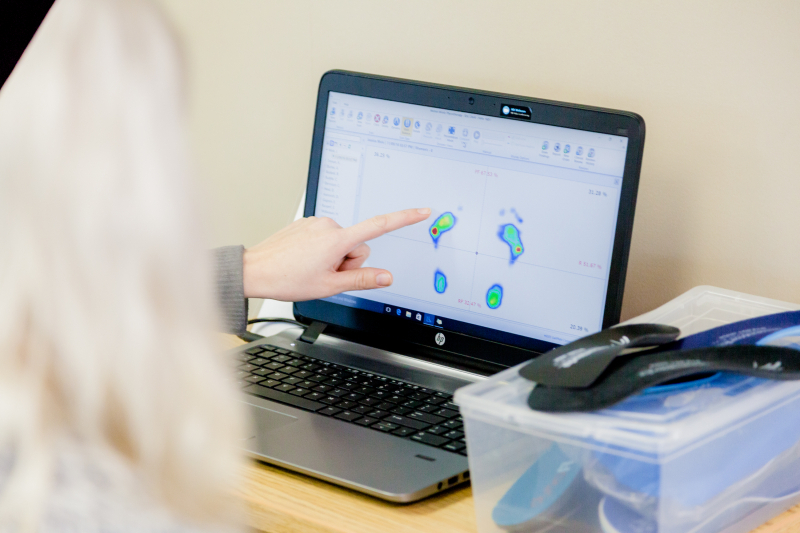 If you are interested in being fitted for orthotics, or are simply looking for a biomechanical assessment, please contact our clinic to book an appointment with one of physiotherapists. DON'T FORGET YOUR PAID EXTENDED HEALTH BENEFITS EXPIRE DECEMBER 31, which for many include custom orthotics!